The idea of selling medical devices into the Chinese market has an obvious allure: the market is large and getting larger. China has an increasing disease burden, with cardiovascular events alone expected to increase by 50 percent between 2010 and 2030 due to the country’s aging population. According to the U.S. Department of Commerce’s International Trade Administration (ITA), China’s medical device market was US$32.6 billion in 2013 and is on track to top US$56 billion in 2016. Market growth for medical devices has been influenced by numerous factors, including increased government investment in rural healthcare, government support for insurance plans, and growing replacement demands in healthcare facilities, according to a Deloitte Shanghai article. On the other hand, navigating China’s regulatory requirements has become increasingly difficult in recent years, among several other challenges. China’s best-selling medical devices, according to the ITA, include in-vitro diagnostics, orthopedics, implantable artificial organs and stents, and imaging equipment. Diagnostic imaging devices, medical supplies, orthopedics and implanted devices, and dental devices and supplies make up approximately 70 percent of medical device demand, according to a Novotek China report. 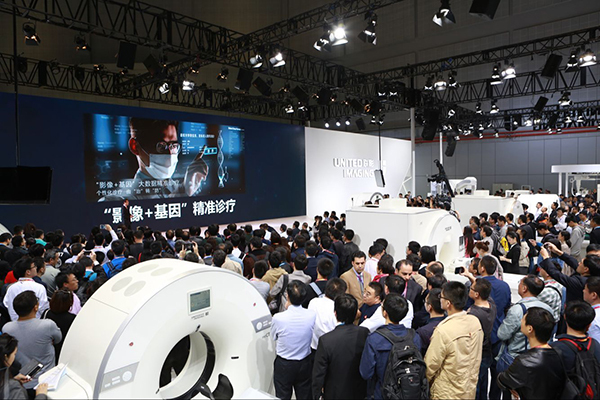 China International Medical Equipment Fair reports that imports make up about 80 percent of China’s middle- to high-end medical devices, with low-end equipment mainly produced in-country. A market overview from Steven Elsinga, an associate at China’s Dezan Shira & Associates, asserts that reliance on imports is especially strong for higher-tech, higher-priced devices. The ITA reports that the U.S. is the primary country exporting medical devices into China, followed by Germany and Japan. Large companies selling medical devices into China include GE, Philips, and Siemens. More recently, some manufacturing has been shifting to neighboring Asian countries, which offer lower import costs for China. Singapore, for instance, is becoming a healthcare technology hub home to 30 global medical technology manufacturers that produce US$3.7 billion (SG$5 billion) in medical devices within the country’s borders. Urs Mattes, Managing Director of the Chinese market for Mathys Ltd. Bettlach, a Swiss company, notes that the Chinese medical device market was unregulated when he first started watching it in 1998. “The market has changed a lot since then,” he says. Today, medical device quality and safety issues are now a priority for the Chinese government. The China Food and Drug Administration (CFDA) regulates the country’s medical device market. The ITA reports that 2015 fee requirements set by the CFDA for class II and class III devices have been established at US$32,466 and US$47,508 respectively. Those fees don’t include the renewal cost required every five years, or the clinical trials that are required upon market entry. The CFDA also requires that product details be listed in Chinese. The ITA notes that the CFDA issued a number of rules in 2015 and at the beginning of 2016 for importers, including rules around the classification of medical devices, measures for quality administration, and clinical practices. To add to the complexity and friction, licensing is processed via third parties called “tenders,” which operate on the provincial or city level, and which may even be large hospitals. Tenders control prices and determine if a company or product is qualified for sale. Companies therefore need to find and deal with the appropriate tender, in addition to getting approval from the CFDA. Mattes adds that most of the individuals carrying out the regulation of the medical device market are not knowledgeable enough to adequately assess incoming products, he says, even as they make executive decisions. Appeasing them can make or break a deal, he notes, making the process a highly political one. Mattes and others warn that entering China puts companies inexperienced in doing business there at risk of having their patents copied by local manufacturers — copying that the Chinese government often supports. "Intellectual property (IP) protection is the No. 1 challenge for multinational corporations operating in China," wrote Andreas Schotter, of Ivey Business School at Western University, and Mary Teagarden, of Thunderbird School of Global Management, in the MIT Sloan Management Review in 2014. "According to the U.S. government, China accounted for nearly 80% of all IP thefts from U.S.-headquartered organizations in 2013." The authors suggest nine IP protection practices for companies to use to protect themselves, including having strategic clarity for Chinese operations to avoid bringing more IP into the country than necessary. Grace Fu Palma, CEO of Boston-based China Med Device, a company that helps small- and medium-size device manufacturers enter China, says that the first key to selling there is understanding the Chinese culture. A Beijing native who regularly travels to China, Fu Palma notes that significant differences in the nature of deal-making can be challenging for newcomers to business there. “The Chinese like meetings, whereas Americans like contracts and documents,” she says. Deals often happen very quickly in those meetings, she adds, which can put those used to more formal, methodical negotiating and deal-structuring at a real disadvantage. The ITA notes that according to the 2015 China Medical Device Industry Development Bluebook, issued by China Medical Pharmaceutical Material Association, there were approximately 16,000 Chinese medical device manufacturers active in 2015. Mattes says Chinese hospitals have begun to favor lower-priced domestic products, especially as those products become more sophisticated. And Chinese companies may well become more and more competitive both in terms of technology and pricing. The Chinese government, along with favoring local suppliers, has further invested in R&D efforts for China’s large medical device manufacturers, such as Beijing Wandong Medical Equipment Co., Mindray, Shandong Shinva Medical Instrument Co., and Weigao Group Co. These investments are likely to pay off for the domestic industry, according to China Business Review. Ultrasound machines made by China’s Mindray are already about half the cost of similar machines produced by Philips. One way to mitigate the risks presented by these various challenges is to find a Chinese partner. A variety of medical-device partnerships have already been able to thrive within China. The French company Eye Tech Care SA partnered with China-based Everpine Capital to expand Eye Tech Care’s non-invasive glaucoma treatment into China. California-based Hansen Medical in 2015 established a distribution deal with China National Medical Device Company to allow the exclusive sale of Hansen’s Magellan Robotic System in the country. The technology is used in vascular surgery, and the collaboration allows for further commercialization opportunity for Hansen while serving an increasing vascular disease burden in China. Government agreements have also set the tone for more effective commercial partnerships. In 2015, the U.S. and China took steps to reduce drug and medical-device application backlogs in order to speed time to market of imports, according to the U.S. Department of Commerce. The agreement includes further expansion of clinical trial exemptions for medical devices and enhancing pre-submission consultation opportunities for medical device applicants. The new outcomes will “pave the way for significant increases in US exports in healthcare,” said the Commerce Department. The bottom line, says Mattes, is that China may not be a good choice for manufacturers who don’t already have significant experience in overseas markets. But for those who do, as well as those who can find the right partnerships, the potential rewards are enormous. Alana Assenmacher is a news consultant for GHCi.